Parineeti Chopra's "Daawat-e-Ishq" had a decent opening weekend compared to Sonam Kapoor's "Khoobsurat" movie. Parineeti Chopra's "Daawat-e-Ishq" had a decent opening weekend compared to Sonam Kapoor's "Khoobsurat" movie, but the overall box office collection of both the films remained dull. Chopra and Aditya Roy Kapur starrer romantic film "Daawat-e-Ishq" was expected to lead at the box office with good numbers, but the film managed to fetch average numbers. In its opening weekend, the film minted ₹13.6 crore, Bollywood Hungama reported. On the opening day, it fetched in ₹3.72 crore, Saturday ₹4.35 crore and Sunday ₹5.53 crore. The film showed upward trend in its business on Saturday and Sunday, despite mixed reviews. The romantic film, directed by Habib Faisal and produced by Yash Raj Films, opened well in the overseas market. On the first day, the film minted around ₹61 lakh from the US, UK, UAE, Australia, New Zealand and Malaysian box office. The combined opening day overseas total and weekend domestic box office collection stands at ₹14.21 crore. Sonam and Pakistani actor Fawad Khan starrer "Khoobsurat" witnessed slow growth in its box office collection at the domestic box office. The film, which is a remake of the old classic film with the same name, minted ₹11.23 crore from the foremost weekend. The negative word of mouth and average reviews affected the collection of the film in India. On Friday, the film accumulated ₹2.74 crore, Saturday ₹3.74 crore and Sunday ₹4.75 crore. But the film opened well in the international markets. The first day box office income of the film from overseas market stands at ₹1.93 crore. 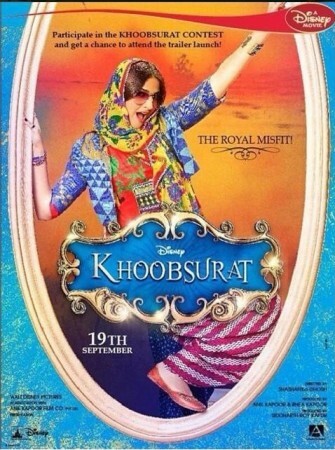 In India, "Daawat-e-Ishq" is leading the box office, but in overseas "Khoobsurat" has taken the lead. As expected, the film opened well at the Pakistan box office. Khan's debut Bollywood film earned around ₹90 lakh from the neighbouring country. Both the movies will have two weeks run to earn money, till Hrithik Roshan and Katrina Kaif's "Bang Bang" is released.